The refurbishment plans will see a significant increase in the number of internal seats for customers and involves a complete refit of B Deck, including a state-of-the-art galley and new toilets. Red Funnel have put together a fun video showing how Queen Victoria might travel to the Isle of Wight if she were alive today. Complete with Beats headphones, Tinder and SnapChat, watch the video to see how she does it. An Isle of Wight company is about to benefit from an injection of £7m from Red Funnel which will secure 85 highly skilled jobs. 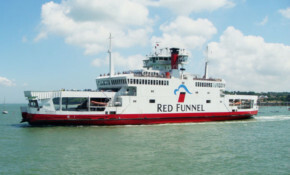 The infrastructure equity investment arm of M&G Investments has announced it's agreed to sell its 100% equity stake in Red Funnel. Staff at Red Funnel have welcomed some four-legged VIPs to the company’s Southampton head office for the day. Red Funnel’s support will enable 15 Etchells racing events to take place in Cowes this year with two x four person and one x three person crews taking part in racing. Red Funnel is celebrating after landing another prestigious global award for excellence in health and safety. May the fourth be with you on Red Funnel's Millennium Falcon today. A bit of fun to bring a smile to the faces of staff and passengers. £50,000 of funds raised by Red Funnel for Ability Dogs 4 Young People, the ferry company’s chosen Charity of the Year for 2016, has meant the charity could buy a van for the training of its assistance dogs.